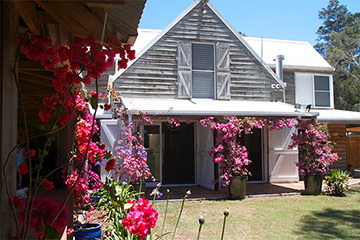 Located in the Byron Bay hinterland in the North Coast region of New South Wales, Newrybar Downs is set on a spectacular 10 acre property of tropical garden, rolling lawns and country homestead. This beautiful luxury accommodation sanctuary provides the ideal venue for a memorable wedding ceremony or corporate retreat with a difference. With multiple areas for group enjoyment - from the park like grounds, rainforest and relaxation area to the swimming pool and outdoor cabana, Newrybar Downs provides an environment of privacy with the ability to enjoy exclusive use of the venue for your event or special occasion. The property is available by the hour, day or evening. 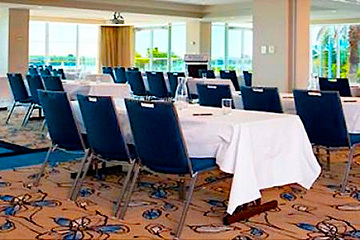 This dream luxury accommodation property strikes the right balance for residential conferencing, corporate workshops, incentives, seminars, product launches and more with multiple break out areas - two sitting rooms, two dining rooms, an outdoor cabana that allow for separate workshops. The homestead is furnished with interiors of the highest standard and can accommodate up to 6 people onsite, or 20 people by partnering with a local guesthouse. The property is also wheelchair compliant throughout. Newrybar Downs provides a breathtaking setting for a wedding ceremony, where vows can be taken on the Fairway Macadamia Tree or Tropical Garden, before enjoying cocktail hour with guests, relaxing to the sounds of world class local musicians or a friendly game of bowls. Guests can indulge in the best of regional fare at Harvest Deli, Bakery or Harvests Hatted Restaurant just a short stroll away in Newrybar Hamlet. Catering can be provided by these suppliers to the property by request, as well as many other local catering companies. Activities available at Newrybar Downs include workshops, classes, the beautiful Gaia Spa Retreat and the world's best beaches are just a 10 minute drive away. We work with local catering companies and restaurants in Newrybar Hamlet to provide all your catering requirements. Audio visual needs can be organised on request.